Another deadly school shooting brings about predictable political behavior, something we always see after these horrific incidents. We can’t get through a reasonable grieving period after the recent shooting in a Florida high school before the event is politicized. The discussion we should have about empowering state law enforcement to handle persons who exhibit warning signs is suppressed by demagogues regurgitating calls for gun control. But first, we must allow grieving to take place. It’s not appropriate to have a discussion about solutions in the immediate aftermath of such incidents. When people are still in a high state of emotion, rational thought cannot take place. Emotionally driven public policy is always flawed because it never considers the law of unintended consequences. Take the 9-11 Commission, for example, which should have taught us about emotionally driven policy. It led to increased government authority to spy on American citizens without real oversight, and contributed to the abuses we are hearing about regarding the FBI spying of the Trump campaign and administration. Unfortunately, this predictable political ritual quickly begins in the aftermath of tragedies and ignores the pain and suffering of the victims’ families. First, there are the usual calls for more gun control with support for the erosion of Americans’ Second Amendment rights. This includes calls for some nebulous idea of universal background checks, banning internet sales of firearms, and closing the so-called gun show loophole of purchases. Then there are calls for limits on ammunition purchases and banning certain types of firearms. Then, of course, there will be the exploitation of victims where the media will find some grief-stricken parent of one of the deceased to demand more gun control and demonize the National Rifle Association, its supporters, and Republican politicians. On the other hand, there are calls for target hardening of schools, arming teachers, and hiring former law enforcement officers and military personnel as school security. 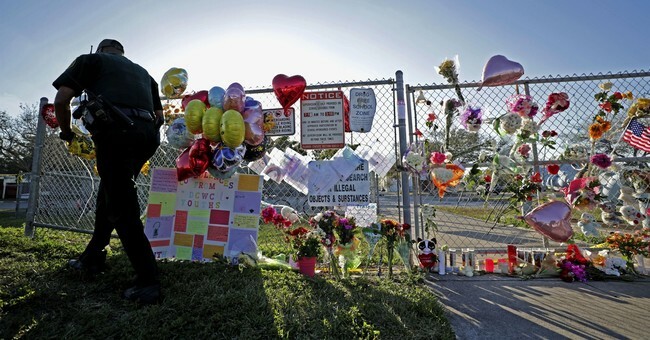 These are quickly determined to be too costly, and gun control advocates shoot down any suggestion of ending gun-free school zones despite the obvious need to support self-defense in schools. As the days pass and more is learned about the incident, we usually find out that the suspect had appeared on law enforcement’s radar only to have the investigation determine that the guy posed “no substantial threat.” More could have been done by the FBI after they were notified. It seems like a cursory investigation – just enough to say they looked into it. The “See Something, Say Something” campaign played a role in the Florida school shooting and it failed miserably. Some did say something, yet nothing was done by the FBI. Others saw something and said nothing. On the state level, mental health policies have tied the lands of law enforcement. Mental health plays a role in mass shootings, and this relationship needs greater exploration beyond the standard calls for increased funding. The suggestions of gun control, background checks, and increased mental health funding are technical fixes that will do little to prevent mass killings. That is low hanging fruit for politicians and talking heads. It’s easy to pick because it can be reached from relative safety at ground level. Suggesting bold, new solutions is politically and personally dangerous. We need an adaptive fix which is a change in behavior. It requires us to reexamine policies about handling people who display a danger to society well before they commit a heinous act. Many potentially dangerous and mentally ill people currently roam the streets even after exhibiting violent tendencies. It’s unconscionable that we allow it to continue. That court decision restricts state authority from involuntarily confining anyone for mental illness, and it continues to haunt us today. Proving that someone is too dangerous to not be committed is a very high threshold. Today, states cannot incarcerate mentally ill people who are not exhibiting actual violence. That usually occurs after a mass shooting. And try as they might, but family and friends are not trained and often incapable of handling mentally ill people. In other words, mentally ill people who come to the attention of law enforcement or mental health officials are allowed to drift until they do the unthinkable. Then the public and media ask why something wasn’t done beforehand. Numerous Presidential Commissions since the 1950’s have been appointed to make recommendations to better serve the mentally ill. Despite some good recommendations, little action was taken to implement them. The same exercise will occur over the recent Florida school shooting and we’ll feel good about ourselves as having done something when we haven’t done anything at all. And thus, the ritual completes it cycle and everybody goes home. Let’s stop blaming the guns, background checks, ammunition sales, the NRA, and law enforcement. Instead, let’s get the courts to reexamine the flawed 1975 O’Conner v. Donaldson decision so states have greater flexibility in institutionalizing people before they kill.